SkyCycle: Would it Fly in Vancouver? Riding along elevated bicycle highways passing over busy roads without having to stop. Imagine the Dunsmuir Viaduct without any motor vehicle traffic. A SkyCycle in Vancouver would be really wonderful. For the most part though, unlike London, there is typically space available near rail lines here making elevated paths on top of them unnecessary. Still, there are a few spots where elevated structures would make cycling a lot better. A 750m elevated walking and cycling path from Grandview Hwy North and Clark to near the Home Depot over the False Creek rail yards was seriously considered a decade ago as part of the Central Valley Greenway. Unfortunately, it was killed for budget reasons leaving cyclists to contend with the 13% grade up to Clark by VCC and forcing them to cross two legs of the busy Clark and 6th intersection. Since it follows the railway, the Central Valley Greenway has a lot fewer stop lights than parallel roads like Broadway and Lougheed Hwy. Last time I used it, I didn’t hit a red light between Caribou Road and Rupert Street. Little would be gained elevating this section. On the narrow section between Lillooet and Boundary, the SkyTrain is elevated leaving space on the ground for the Central Valley Greenway. With the completion of the Powell Street Overpass this summer, the section of Powell Street between Clark Drive and Wall Street will be the only missing link in the Portside Greenway. An elevated path over the railyard in the Port is certainly one possible option. A less expensive solution would be to reallocate a lane of traffic on Powell Street to create a separated bike path. The new Low Level Road currently under construction in North Vancouver will include painted bike lanes on both sides of the road. However, with high vehicle speeds and lots of trucks, it will not be a great cycling route for people of all ages and abilities. On the north side, cyclists will be sandwiched between the traffic and a tall concrete retaining wall. Yikes! The Spirit Trail is the alternate route. Unfortunately it is much longer, very hilly and is further from the water. A bicycle and pedestrian path over the rail yard would be a much better option. Hopefully they will built it soon once they realize that people really want bicycle paths separated from traffic that are flat and by the water. The main barrier to cycling short distances is lack of safe infrastructure such as cycle tracks. For longer trips, the big barrier is time, effort and distance. Typically, the average distance that people will cycle to work is around 6km. In Germany, they have found that this increases to 9km with electric bikes. While it is not possible to reduce distance, time and effort can be significantly reduced by eliminating the need to stop at intersections. Many cities have old railways that have been converted to bike paths with overpasses and underpasses eliminated the need to stop. Paths following rivers, oceans and railways typically have fewer intersections. Bike paths outside of city centres in the Netherlands often have underpasses and overpasses where they meet highways. A great example of this is the Hovenring in Eindhoven, Netherlands. 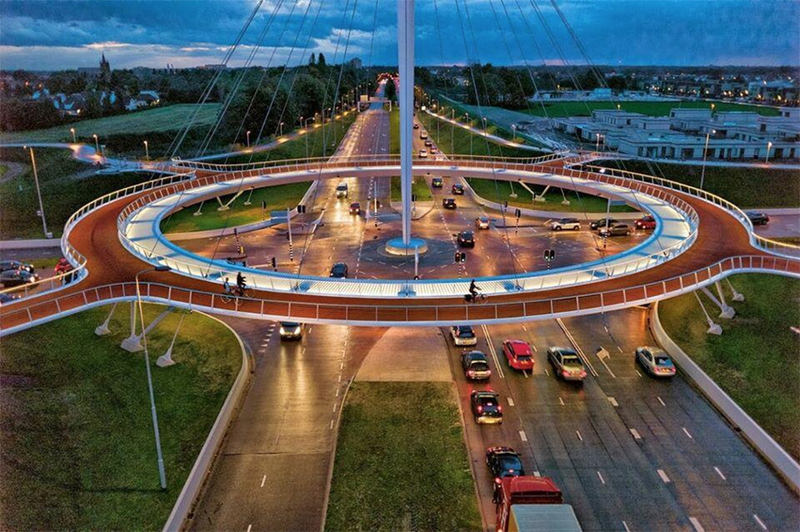 This spectacular circular overpass enables cyclists to safely cross a roundtable without stopping. Dutch and Danish towns and cities that have great on-street cycle track networks in their cores, often have bicycle paths with limited stops between communities. These paths compliment the on-street cycle track network delivering shoppers and commutes to the town centre. Even the largest cities, Amsterdam and Copenhagen in these cycling friendly countries are not much over half a million people in regions of around two million. It is does not take that long to get out of the city to the countryside where there is plenty of room for bike paths. Contrast this to mega cities such as London with over 8 million people. And growing. It takes a long time to get out of the city. Space is at a premium in cities like London. The railways are definitely not abandoned. They are carrying hundreds of thousands of passengers a day. And they are building more rail. The elephant in the room for transport in London is the growth of population and the resultant increase in population density. Transport for London boasts that Crossrail will add 10% to London’s transport capacity, but London’s population is growing faster. The urgent need for another one or two new Crossrail lines should not be underestimated. Added new rail in London is very expensive and can take decades to complete. Crossrail is Europe’s largest infrastructure project. The 118km line, which is currently under construction, includes 42km of new tunnel at a cost of £14.9 billion. Cost estimates for the proposed Crossrail 2 range from £9.4 to “only” £12bn. Crossrail has been in the works for 40 years. Stations also have to be rather deep to avoid existing tunnels and other stuff underground. So, cycling is just about the only option to improve transportation capacity in London especially in the short term. This is one of the main reasons why they have spend hundreds of millions of pounds on bike sharing and have committed around a billion pounds to creating cycling routes including Cycling Superhighways named after their Tube lines. The first planned route, from Stratford to Liverpool Street Station, is estimated to cost around £220 million for 6.5km, $59 million per km. Early studies of a SkyCycle system indicate that it provides capacity at a much lower cost than building new roads and tunnels. Light Rail running along city streets will cost around $100 million per km when the costs of the vehicles and vehicles storage facilities needed for 12,000 passengers per hour are included. The cost jumps to around $200 million per km for elevated sections and $300 million per km and up for underground rail. Emphasis on up. That said, both elevated and underground rail typically have greater capacity than SkyCycle. Foster says that SkyCycle would allow cyclists to raise their average speed from 10mph (16.1 kph) to 15mph (24.1kph) in the city, protect their lives and cut journey times significantly. With stops or stations km apart, the same distance proposed between SkyCycle ramps, street level light rail averages between 20kph to 30kph while elevated or underground rail averages around 40kph. However, with cycling, there is no waiting for the train, walking to the stop or transferring so the door to door travel times for SkyCycle will be competitive for many trips and perhaps even more important, more predictable. In a big city like London, where many trips are greater than 6km, this should dramatically increase the number of trips within the time and distance people are willing to cycle. Electric bikes could increase the distance even further while making quick work of the long ramps up to SkyCycle. Some people are concerned that SkyCycle is a substitute for cycle tracks on city streets. It is not an either or though. Busy high streets are great places for slow city cycling. People ride there to see and be seen. With a lot going on and people wandering about, not great places for fast commuting, fast recreational cycling or training though. That is where long straight paths with no intersections like SkyCycle are perfect. To be successful, SkyCycle will need comprehensive networks of cycle tracks along city streets to attract people on bikes to it. Door to door safe fast transportation. SkyCycle should also make it politically easier to build cycle tracks on city streets once businesses realize that the combination of SkyCycle and cycle tracks will deliver customers to their door. Like any city, London has many sections of streets that are interesting to walk and cycle on. However, like any city, it also has long sections of streets and even parts of town through industrial or even residential areas that are not very interesting or attractive or safe for that matter. 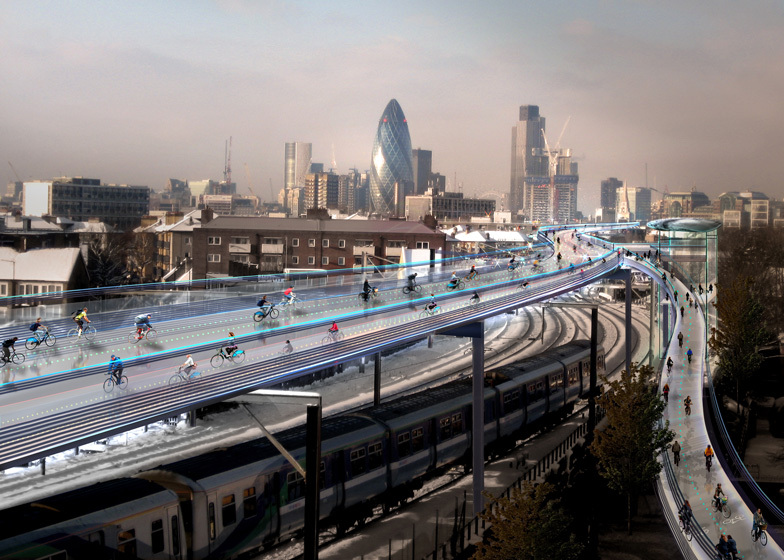 While I don’t know London and the specific routes well enough to say for sure that what is proposed would be successful, the SkyCycle concept can definitely make sense in city like London where space is at a premium as long as it is accompanied by investment in on-street cycle tracks.